Ubuntu Global Jam, Dublin….. Both productive and fun! 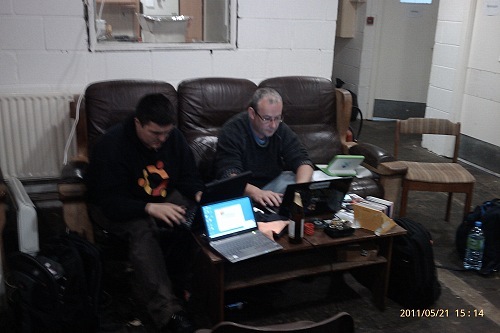 Last Saturday, 14 Sep 13, TOG, Dublin Hackerspace hosted an Ubuntu Global Jam Event from 12 noon till 6pm. I arrived a little early and was met at TOG by Jeffrey Roe (TOG and Ubuntu Ireland Member). We briefly chatted about what we would try to achieve during the event and quickly agreed on the topic of testing the daily build. I set about downloading the daily build iso and building a few live usb sticks from it. Over the course of the next hour or so a total of seven people rolled up their sleeves to get Jammin’. This was a great turnout for our small LoCo. We even had a local young celebrity ubuntu advocate join us. For background on that I’d suggest you read this article and this other article. We set about booting up the usb sticks on the various machines present (5 in total, I think) and straight away we came across our first bug on all machines. Bug# 1225385 “Install log in screen not displaying properly”. The Ubuntu Foundations Team Bug Bot has requested that we file this bug against the the relevant source package. I am not sure how we can do this as this error occurs during boot up. Can anyone point us in the right direction on this? We spent the day testing our machines and submitting the test results. We commented on the test results where we felt comments would help. I came across a couple of usability issues with the system testing application itself. Firstly I experienced some ‘pop under’ windows during the testing process however I could not replicate these and so I did not file a bug against them. Has anyone else experienced ‘pop under’ windows during the testing process? The second small issue we all encountered when submitting our results at the end of the testing process was the fact that no confirmation was received by anyone who submitted their test results. I suppose this isn’t completely necessary but it did leave us wondering whether or not our test results had been submitted successfully. I did log a bug against this. Bug# 1226581 “No confirmation on submission of System Testing Results report”. This is more a wishlist item than a bug but I do feel that for people who are new to testing this confirmation of results submission would be welcome. If anyone can help with this filed bug please give it some consideration. We failed in our attempts to set up a public Google+ Hangout during the course of the afternoon for other LoCo Team members (Google+ newbie issues hampered this attempt. We will be better prepared next time). Having failed in our attempt to set up a public G+ hangout we set about hanging out with Laura Czajkowski. This hangout was far more successful and also extremely entertaining. Even from London Laura is a powerful force within our LoCo. My lack of geek credentials provided most of the laughs on the day, I won’t embarrass myself by detailing those laughs here (suffice to say we didn’t quite get as far as “there isn’t any any key!! !”, although it was suggested that I would come out with that one at some stage). I was happy to provide the entertainment! At the end of the Jam we chilled and chatted with some old friends that had dropped by. All in all a hugely successful Jam for our small LoCo Team. Both productive and fun! Footnote: A few more pics of our Saucy Salamander UGJ can be found here. My second experience of the Ubuntu LoCo Team re- approval process. Not as straight forward as the first! Back in the Summer of 2011 my first experience of the Ubuntu LoCo Team re- approval process was very positive and exciting. I happily helped in the preparation and delivery of the Ubuntu Ireland 2011 re-approval application. I even wrote a very enthusiastic blog post about the whole experience. This time though, things were much different…..
Activity in the Ubuntu Ireland Team has decreased significantly since our initial re-approval in 2011. By the summer of 2012 I was becoming concerned that our low activity levels would reduce our chances of retaining our approved status at the next time of asking. I aired my concerns regarding the poor state of the Irish LoCo on the Team mailing list in August 2012 (my initial post can be found here). The positive feedback received led to a team reboot discussion developing which started in November 2012 (my initial post regarding the team reboot can be found here). This team reboot is ongoing but there is no denying that our team activity remains weak. However, despite this low activity it was clear that there were still a few warm cinders in the Ubuntu Ireland Team fire and there certainly was a lot of good will being expressed towards remaining approved. Based on this I felt it was worthwhile for our LoCo to seek re-approval. I prepared our 2013 re-approval application, basing it on the standard template and our 2011 application. Active Team member Keith Drummond provided some very useful suggestions that were incorporated into our application. Our Team was up for re-approval at the 16th of July, 2013 LoCo Council meeting. I was quite nervous and by no means confident about our chances. Despite this I was relieved that the time had come to honestly state the current condition on our LoCo and see how that would be received. We were the third and last team up for re-approval. Two very impressive teams preceded us (The Japanese Team and the Tunisian Team). When the time came we gave a frank account of our slow demise over the last two years. We also maintained that some activity still existed and that the reboot efforts were ongoing. The LoCo council recognised this lull in activity as a somewhat common occurrence. Given due consideration to the remaining activity in our LoCo and the fact that four team members had turned up to offer support for our application the LoCo Council approved our re-approval application. I was truly delighted that we had achieved this and I am very thankful that the LoCo Council saw fit to keep faith in our little LoCo and maintain our approved status. So now to the point of this post…… If you are part of an approved LoCo which has experienced difficulties since your last approval I would strongly encourage you to still seek re-approval for you Team when the time comes again (of course, only if the ‘approved status’ is still in effect). This is embarassing but I was encouraged to blog about my mistake to save others from making a similar mistake (although I doubt anyone else would!). I was curious about this and so I went about signing up just to see how it would go. Unfortunately, during the sign up process, I inadvertently signed up the entire Ubuntu-ie launchpad Team as an answer contact for Ubuntu answers. I made this monumental mistake by clicking a checkbox in the signup process. I did not give this process enough attention and wrongly assumed I was just confirming my membership of the team. I did not realise that I had made the mistake until I checked e-mails a couple of days later (I don’t always check my e-mail daily). I was shocked, not only at the huge level of mails, but also by the number of team members deactivating their memberships of the ubuntu-ie launchpad team. I was confused and I still did not fully understand what had happened. Had I done this? Was I the cause of team members deactivating the memberships? It slowly dawned on me that I was the culprit. I felt sick. Thankfully Laura Czajkowski had already stepped in and sorted things out. Through the Ubuntu Ireland mailing list I sincerely apologised for the flood of ask ubuntu e-mails that people had received. It was never my intention to sign up the Ubuntu-ie launchpad team to this service. I learned a valuable lesson through this unfortunate experience. As an administrator of the Ubuntu Ireland Team I need to be a lot more careful when dealing with Team matters online. Yes indeed…. too much power is a dangerous thing. A week ago today I was accepted as an Ubuntu Member at the Membership Board meeting held on the 20th of March 2013. I genuinely feel honoured and delighted having been accepted as a member. My name is Mike O’Donohue and I am an active member of the Ubuntu Ireland Team. I cannot be considered technically proficient by any measure and as a consequence my humble contributions to Ubuntu centre on advocacy efforts and helping out with team activities as best I can. I have great admiration for, and belief in, the Ubuntu project. The philosophy behind the project is what drew me to it. The fact that someone like myself can become an active member of this larger community is absolutely amazing. Above all I am a user of Ubuntu (I am one of those human beings) and I’d like to take this opportunity to sincerely thank everyone who has contributed to making Ubuntu what it is today. I also extend my heartfelt appreciation to all those currently working on the project bringing it to the next level. 2012 was a relatively quiet year for the Ubuntu Ireland LoCo. It started off strong, just as 2011 had finished, but activity seemed to fizzled out as the year went on. As I did with the 2011 year end roundup, I’ve taken details of our 2012 activities from the Ubuntu Ireland LoCo Team Portal Page and, of course, the links that emanate from it. There were a couple of Ubuntu hours held in Dublin early in the year however attendance was low and a decision was taken to suspend these events for the time being. In addition, Laura Czajkowski, when back in Limerick, also organised a couple of Ubuntu Hours putting a fresh spin on the term calling them Limerick Happy Hours. 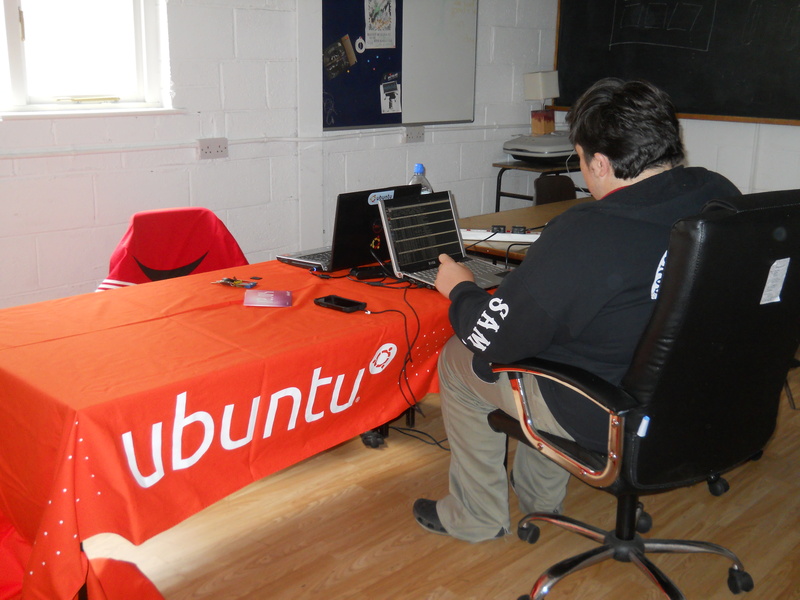 At the end of January, a LoCo Team member attended Campus Con 2012 in Waterford and distributed Ubuntu CDs at the event. 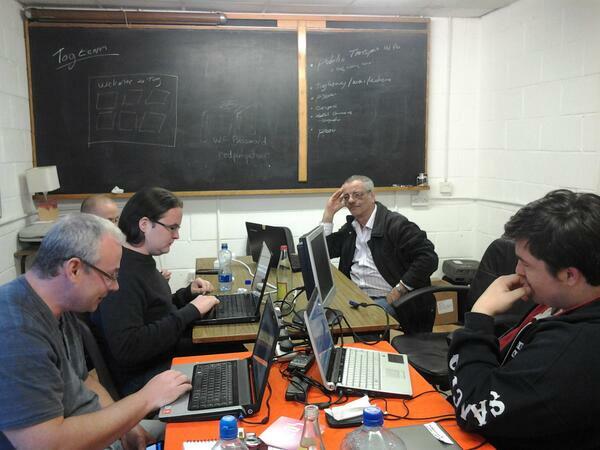 In April, we hosted a release party for Ubuntu 12.04 LTS (Precise Pangolin) in Dublin. It was a quiet affair but enjoyable none the less. A few photos taken during the party can be found here. We held six IRC Team meetings in the first seven months of the year but again participation at these meetings declined over time and by July it was decided to suspend these also. Efforts to reboot our Loco began in the second half of 2012 and I am delighted to say that these reboot efforts are ongoing. In early October members of our LoCo attended Skycon’12 which was hosted by Skynet, the University of Limerick Computer Society. This conference took place at the University and the Irish LoCo manned an Ubuntu table in the conference common area. Our sincere thanks go to Canonical for providing us with a conference pack for this event. A fuzzy pic of me at the Ubuntu table can be seen here. This was a great conference, with many wonderful speakers including Mark Shuttleworth whose talk was inspiring. October was a good month rounded of with two release parties for Ubuntu 12.10. TOG, the Dublin Hackerspace, very kindly hosted a release party for the Quantal Quetzel in conjunction with their monthly open social evening on Saturday 20 Oct 12. This again was a quiet affair. 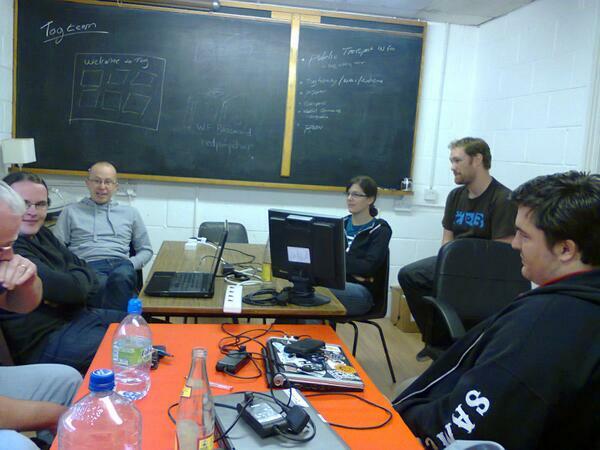 The second release party for Ubuntu 12.10 was hosted by the University of Limerick Computer Society in Limerick on the date of release, 18 Oct 12. Reports from there indicate that a good night was had by all. So that was 2012, a relatively quiet year for our LoCo in my opinion but we are still ticking. I do hope to see momentum build again through 2013 and beyond. I have great respect for the Men’s Shed initiative and I follow our local Men’s Shed on all the usual social media outlets. A few days ago I was at home and I happened on a tweet from @athymensshed indicating that one of the members would be at the shed that morning working on computers. Keen to find out more I headed over for a chat. I met Tim at the door and he welcomed me in for a tour. I was shown the well laid out woodwork area and right beside this I saw the bike repair workshop where they refurbish old bikes for reuse. This is a source of income for the shed which helps to keep it afloat. They stored old bikes in an adjoining room and in yet another room some members were using their skills to restore a fabulous old horse drawn cart (sorry, probably not the best name for it). Upstairs in a smaller room Tim showed me the computer workshop. He told me that they refurbish discarded hardware for reuse. We chatted about linux and Ubuntu and it was clear to me that this man was an uber geek familiar with all things Open Source. He uses linux for the refurbishments. The tour ended with a trip to the kitchen where we chatted some more before I left. Having explained the Ubuntu release structure I gave Tim a bundle of 12.04 CDs in the hope they would come in useful. He was happy to receive them. He felt the LTS release would be best suited to what he was doing. Ubuntu or its derivatives are perfect for this kind of work. What a great place! Refurbishing old equipment for reuse and fostering a community spirit. At the shed everyone is both a teacher and a student who teach and learn new skills to and from each other. My respect is confirmed. A great initiative in these recessionary times. I got a real sense that the shed was similar to Hacker/Makerspaces in many ways. I wonder, where a Men’s Shed exists shouldn’t the nearby Ubuntu LoCo establish contact with geeky members to see if help and support can be provided? One thing we suffer from in the Irish Loco is a severe lack of regular bloggers who find the time to blog about our activities. I resolved to do more on this is 2011 but, alas, I failed miserably. Hopefully 2012 will be better (both here AND on others blogs!!). As I’ve said before I am one of the least geeky member of the Irish Loco. I am just A.N. Other user of Ubuntu who partakes in the social aspects of the Irish LoCo’s activities and whatever advocacy effort that entails. As 2011 fades away I thought I’d recall our activities from the past year just so my memories of these won’t also fade. Of course all these details can be found by viewing the Ubuntu Ireland LoCo Team Portal Page, Mailing List Archive and the Team Reports Wiki Page but I thought I’d like to review the past year, to remind myself of what was achieved, and while doing so I thought it would form the basis of a potentially interesting blog post! Ubuntu Hours were frequent in both Dublin and Limerick throughout the year but in both cities attendance dwindled and attempts were made in the latter half of the year to revitalise our approach to these. Broadly, we looked at changing the venues types for our Ubuntu Hours, we thought about mixing it up a bit like heading for a café instead of a pub. We also latched on to the idea of varying the days of the week on which Ubuntu Hours would be held. Back at the end of bitterly cold January we hosted a bowling event in Dublin which was alot of fun. My young son got an ‘assisted’ double at the start of game 2, a fete that was captured in this picture. Also in January some members of our LoCo produced their first podcast. Unfortunately, after only a couple of episodes, time constraints halted their podcasting activities at least for the time being. 1) To have a release part on the actual date of release! 2) We wanted to see if holding the release party on a weekday evening would facilitate more potential revellers. Ultimately we had a fun but poorly attended party. A couple of pictures of the event can be seen here. Apparently midweek release parties don’t sit well with the Irish psychi. In May Ubuntu Ireland was confronted with the looming Reapproval Process. We held a face to face and IRC meeting to formulate our our approact to this reapproval process and to assign tasks for the completion of the application. In June we were reapproved. A picture of two members who participated in this meeting, and my enthuastic views on our successful reapproval application, can be found in an earlier post here. June 2011 was arguably the busiest month thus far for out Loco. On top of our successful reapproval we also hosted a Geeknic in Limerick during the lunch hour of 3DCamp, the first Ubuntu Ireland Geeknic to take place outside Dublin (read an earlier post here) as well as a fin meet and greet event with canonical employees at the very end of June (you can read a bit more about that here). The second and final Geeknic of the year was held in August, back in Dublin’s Stephens Green. Historically speaking, Stephens Green was also the location for our first geeknic which was the second geeknic ever!!! (if you fancy a blast from the past take a look here). While the sun shone yet again the turnout at this geeknic was low (some pictures here). Perhaps we should return to the cooler, potentially wetter months of May and September for 2012. On the 4th of September, for the first time ever Ubuntu Ireland hosted 3 Global Jam events spread across Ireland in Galway, Limerick and Dublin. The Makerspaces/Hackerspaces in these cities made these events possible and the thanks of our Loco community goes out to these, namely 091labs, Milklabs and TOG. In fact TOG has very kindly hosted many of our Global Jam events in the past. In September we did not hold our montly IRC Team meeting due to poor attendance, but hey! that just proves that these LoCos are fluid entities, dependent of volunteer participation. Apart from September we held monthly IRC meetings every month in 2011. October saw us celebrate the release of Ubuntu 11:10 Oneiric Ocelot. We returned to weekend partying for this release. The party was held on Saturday the 15th of October 2011. In honour of the Ocelot, the troops went for a bite to eat in a Mexican themed restaurant in Dublin which was, of course, followed by the mandatory trip to a pub to close out the evening. I missed the restaurant due to work but hooked up with the party when it reached the Porterhouse in Temple Bar later on. For the first time ever I had a few drinks with the guys and I must say it was a great night. There was a good turnout for this party with many new faces. I took a few pictures an the Porterhouse and they can be seen here. A Dublin Ubuntu Hour in October and a Limerick Ubuntu Hour in December closed out the year nicely. And that was 2011. On reflection, I reckon that was quite a lot for a small LoCo like ours. We tried a few new things that didn’t always work, but still, they were worth trying. Some members of the LoCo participated in cross group collaborative activities also. Hopefully 2012 will be just as good if not more so. Ubuntu Ireland Meet and Greet with Canonical in Dublin. 6 months late with the write up! I only got to talk with a few canonical people and they were great to chat to. Unfortunately, as I don’t live in Dublin, I wasn’t able to provide them with good information nuggets about Dublin. Regrettably, I had a very strict limit to my time in The Porterhouse (Cinderella syndrome) . As well as arriving there at the end of a 12 hour working day I had the unenviable prospect of dealing with a 12 hour shift the next day also! On top of that the need for a long commute home that night and again the following morning weighed heavy on my mind. All this prevented me from diving into the excellent atmosphere that was brewing at the Porterhouse. I managed to take just a few photos before I broke the battery housing on my daughters camera. The few pictures that I took can be found here. I do hope all the Canonical folks had a productive and fun time in Dublin. 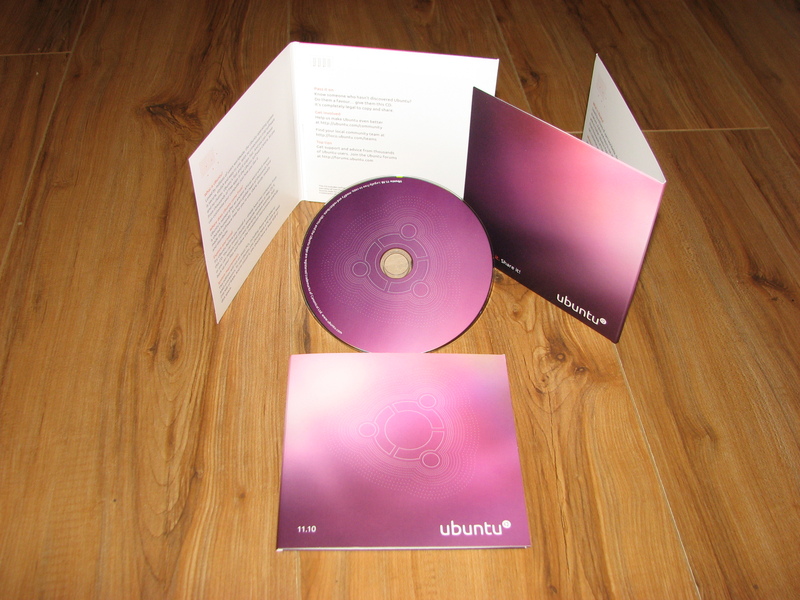 The Irish Ubuntu LoCo Team have Ubuntu 11:10 (Natty Narwhal) CDs for you! The applicable software licences allow you use the Ubuntu Operating system. Furthermore, you can use the one CD to install Ubuntu on as many computers as you would like! Finally, you can pass on the CD to someone else when you are finished with it. So why not give it a try? If you’re interested but not sure yet, you can try the Ubuntu OS directly from the CD without installing it (just make allowances for running an OS off a CD, it will operate slower than from a hard disk). You can run Ubuntu from within MS Windows using Wubi, you can run Ubuntu alongside Windows or indeed alongside any other OS, you can run Ubuntu from a flash drive, the possibilities are extensive! Ubuntu is great for revitalising slower or slightly older hardware. Remember to always back up your data before installing any OS. So to get a free CD just send an e-mail to rory at technomancy dot org. You can arrange to send Rory a stamped self addressed envelope, large enough to take a CD. Rory will then get one out to you. If you work with a group and if you would like to get a few CDs then a pickup/delivery option may be negotiable depending on your location and peoples comings and goings. If not I’m sure An Post can facilitate you to! To find out more about the CDs or Ubuntu in general you can check out the Ubuntu Ireland website for contact and link details. My first experience of the Ubuntu LoCo Team re- approval process. First of many I hope! The Ubuntu Ireland Team was re-approved at the LoCo Council IRC meeting which was held on Tuesday the 21st of June, 2011. I was thrilled with this achievement and extremely grateful that the members of the LoCo Council had kept faith in our little LoCo. Paul Mellor of the Ubuntu UK LoCo Team attended that LoCo Council meeting and wrote an insightful blog post, regarding the contents of the meeting, from the perspective of “outside looking in”. Encouraged by reading that I decided to write this complimentary post from the perspective of “a first timer right in the middle of it”. These are my own views on how I saw the Irish Teams reapproval application progress. There are clear concise guidelines on how all teams should go about obtaining an approved or re-approved status (Getting Approved / Approval Guidelines / Re-Approval Guidelines / A Template Application page ). Now my involvement with Ubuntu Ireland only goes back to October 2009 so I missed all that was involved with the team gaining approval in the first instance and as a result this whole process was a bit alien to me. Since October 2009 I’ve been hearing about the importance of team reports, keeping logs of meetings and keeping our events wiki pages up to date. When the call for volunteers came I spotted a way in which I could help the Irish Team so I took on the task of updating the events wiki pages on an ongoing basis (while still not fully appreciating the reason for this). After been given a few simple instructions even I could update a wiki page, on a basic level at least, and this gave me a sense of contributing something!! So I diligently updated our Events Wiki pages first, then I continued to add new events to the wiki and the website. Finally, when available, we added the likeable LoCo Directory to the mix. Jeffrey Roe did a smashing job maintaining our Team Report wiki pages (again, something that I did not realise early on) and we were having regular monthly team IRC meetings with the minutes and logs also being maintained on the wiki (In recent months these have also been linked to the new “Meetings” section of the LoCo Directory). We powered along like this for some time diligently maintaining the wiki in all the areas mentioned above. Late last year we added a centralised online storage point for our event photos to make it easier for everyone to upload photos to and also easier for folks to link to in notices. As a result of all the simple, but necessary, wiki work which we had performed since our initial approval we were primed for preparing our re-approval application. We started discussing the re-approval process during the spring but only set down to the task in mid May. We had a couple of meetings (informal face to face and IRC) to organise ourselves and take ownership of tasks requiring completion. I found these meetings to be a great source of information and ideas. They gave me focus where I was previously flapping in the wind. It was becoming crystal clear to me what was involved, how all the work we had put in to maintain the wiki was now paying off and how we were going to proceed with the preparation of our re-approval application. For our application we followed the standard Template and referred to other successful re-approval applications for ideas. The Wiki content diligently added over the preceding two years formed the backbone of the Experience section. To be honest, we could have put a little more thought into the Roadmap section. As it was, we completed the Roadmap with the simple set of ideas that had been expressed for our LoCo by members of the Team in the recent past. Key Details: These were easily gathered by LoCo team administrators of the various online resources. Rooadmap: no mystery here, we very simply defined, at a high level, what we hoped to achieve during the next two year cycle. Experience: Relied heavily on linking to the wiki content and online photos. Highlighted new activities we had taken part in since our initial approval. By linking to content elsewhere we were able to keep this section neat and concise. Above: 2 Team members working on the re-approval application at a face to face meeting. I’m the one on the right. Once the application was completed and appended to the meeting agenda there was only one thing left to do. Our Team Point of Contact Rory McCann put himself in front of the firing squad (LoCo Council) and dodged (Answered) all the bullets (Questions) fired at him. Many other members of our team including myself shouted support from the sidelines. Rory did an admirable job. In finishing I have to acknowledge the huge contribution Laura Czajkowski makes to the Ubuntu Ireland LoCo. Everyone knows the important community hats Laura wears but she is also a top notch member of our little LoCo, EVEN from across the Irish Sea. Thanks so much Laura for keeping the re-approval message clear throughout the last two years. I didn’t understand what you were talking about initially but boy do I understand now!